This week’s video is a presentation of a modern Timba arrangement, with the primary objective being to demonstrate a good example of a “Timba gear cycle”. 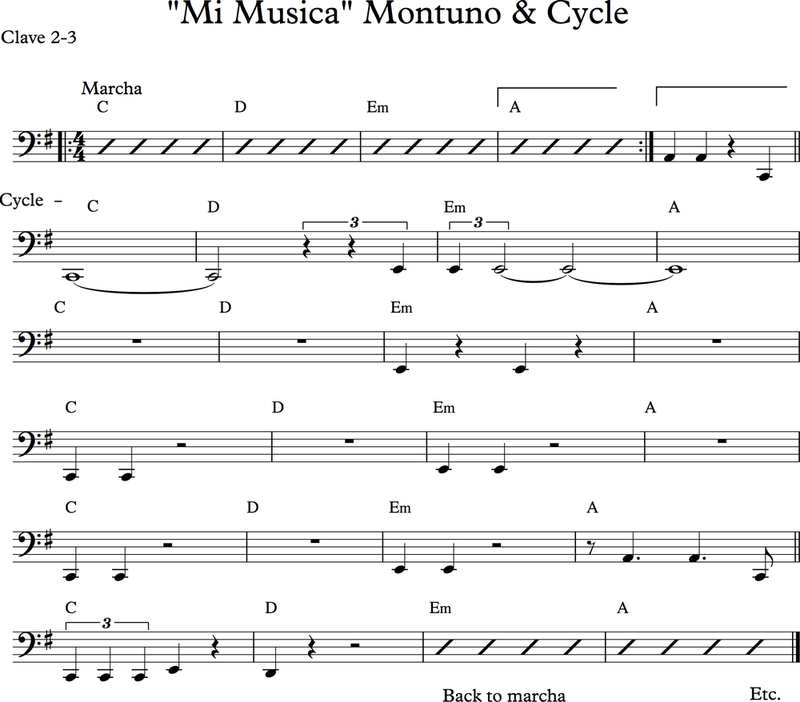 This is often referred to as a Bomba section, which a bit misleading because the Bomba is only one part of a whole network of rhythmic queues that occur within a Timba arrangement. For this demonstration, I picked the song “Mi Musica” one of my favorite groups Havana D’Primera, from the album Haciendo Historia. The montuno section begins at 2:00 into the video. The chord progression is four bars, or two claves, in length and is in 2-3 clave direction. Unfortunately, there is no way to explain the intricacies of a “Timba gear cycle” in one blog. However, the best summation would be that whenever the bass is playing a tumbao, the band is in marcha and when the bass is doing anything else the band is in some form of gear cycle. Furthermore, every Timba group has their own unique gears that are both specific to the band and even the song, which is the case with this composition. The first cycle appears at 3:41 and occurs three more times in the track. In a live performance, there is almost no limit to the amount of times this can transpire depending on the exchange of energy between the band and the audience. Just as with the last blog entry, some of these terms may be new to some readers. If any of these descriptions are unfamiliar to you, be sure to check out my book, The John Benitez Method Vol 1, or any of Kevin Moore’s Beyond Salsa Books. Kevin Moore’s books in particular have some of the most in-depth explanations of timba gears you’ll find anywhere.